According to Nabil (2014), Coca-Cola is the largest beverage company in the world. Moreover, it has been listed as the number one brand by Forbes survey in 2009. It is this prestigious market positioning and brand that has made it possible for the company to have four of its soft drinking beverages in the leading top five across the world. The company is headquartered in Atlanta, Georgia. Its model of business is designed in such a manner that the company produces the syrup and gets it distributed to the end customer through a franchised distribution system by a couple of bottlers since 1889. Regassa and Corradino (2011) further that it is a multinational company with its operations in over 200 countries. The company has employed over 100,000 employees and it prides in the provision of more than 500 brands of beverages. Therefore, the company earns its revenues through a number of channels, particularly, through selling, producing, licensing, and distributing concentrates and beverages to those within the distribution system often the bottling partners, retailers, wholesalers, and distributors. Coca-cola is a public limited company and it is thus listed in the NYSE as part of the DJIA and S & P 500. Coca-Cola was an invention of a pharmacist, John Pemberton who was part of the civil and wanted to do something commercially viable and which would bring him a financial fortune after the war. He had tried to invent a couple of drugs that never sold in pharmacies to the point that he almost became a failure. Because of his consistent failure in inventing and selling of drugs, he decided to try out luck in the beverage market, and that is how Coca-Cola was born. After initiating the formula for the soda, he never was good at advertising, so Frank Robinson came into play, registered the company and played the role of advertisement. Coke did well in its first year, which was 1888, the same year John Pemberton died, never to see the success that he had so much sought after. Thereafter, the business performed dismally, however, Asa Griggs came to its rescue and revived it in 1891. From then, Coca-Cola would grow into the world populous beverage provider, reaching billions of people per day (The Coca-Cola Company, 2016). The report is tailored to appraise Coca-Cola financial objectives and determine how they tally with employee personal objectives, the role of an accountant in the achievement of the company’s financial objectives, evaluation of income statement, balance sheet and cash flow statement to determine attractiveness to the investors. Rations and appraisal methods too are integrated to support the decisions by investment potentials so that they really determine the company’s performance and what the future looks like. According to Martinne (2009), Coca-Cola financial objectives at the moment emanate to be one in particular. The company through its CEO explained on it desires to grow its profitability by double to $200 million dollars by 2020. The financial objective by the company is seemingly the same and not about to change any time soon because, the company reiterated on the same in 2016, 7 years down the line after introducing it (The Coca-Cola Company. 2016). In regards to Lantto and Sahlström (2009), the company financial objective is smart and therefore, it is mostly likely attainable. Even though, The CEO did clarify that the objective, was a bit overstretched for the company, finally did clarify the possibility to meet it with hard work. The objective is specific on doubling the number of revenues the company earns to about $200 billion in a period of 10 years. It is measurable, because, the company can develop some other targets in between the 10 years and determine the progress towards achieving the larger goal. The figure is attainable, as the doubling of the revenues that the company is seeking to achieve is within a stretch of 10 years time. Moreover, the company has other marketing goals that can help propel the attainability of this target. For instance, the company plans to leverage on increase of revenues through an increase in sales in the emerging economies such as China, India, and Brazil. The objective is equally realistic based on the company status in the market as the largest beverage provider in the world and with a reputation and brand that is beyond reproach. Finally, the objective is time-bound as it is stipulated well by the management that the doubling of the revenues is expected to happen within duration of 10 years, from 2010 to 2020. In attaining this particular goal, the company is strategic and has a strategic plan, a vehicle that can propel the company into realizing it. The strategic plan is specific on the means of increasing the revenue increase. At first, the strategy formulated indicates that the company has to double its sales to for soft drinks servings to more than 3 billion per day by the end of 2020. An increase in sales directly translates to increased revenues. Second, the company is focused on emerging markets to leverage on the dwindling sales of the brand in the US. The company makes more than three-quarters of its profits from international market (Lantto and Sahlström, 2009). The introduction of the emerging markets into the puzzle would further increase the margin by which the company generates revenues from international markets. China is one of the countries considered as an emerging market, has the potential of increasing sales for the company as statistics indicate that it has an average of 8 servings of Coca-Cola per year when compared to the United States which has an average of 214. That gap is huge, and it implies that there is a potential of increasing the servings made in China, leading to increasing in the number of sales and consequently the revenues collected from the market. The company seeks to increase the volume of sales that they make in these emerging economies through pricing them at affordable prices (Paul and Sam 2009). Terence and Terry (2003) explain the third strategy that the company plans to utilize in realizing this particular objective is increasing the number of brands that it offers so that it provides an added stream of income. As it is, the company has a number of income streams from a number of brands that it operates. The primary brand is coca cola, and it is classified in the same group with other 12 brands that generate $12 billion, some of which include; Sprite, Fanta, Dasani water, Powerade sports drink and Georgia coffee. Therefore, the company seeks to increase the brand streams to 30 by 2020 with sales of $1 billion. The fourth strategy is geared towards promoting the brand in developed economies and increase profitability. In achieving improved profitability in these countries, the brand has sought to work on a price mix. The price mix formula made it possible for the company within the years to create more small packages and more premium packages such as glass and aluminum bottles. These strategies, have added in long way towards the realization of an increase in price mix by 2 percent an increase in revenues and a consequent increase in revenues by 4% as at 2015( Lantto and Sahlström, 2009). According to Stephen (1998), an accountant is an important part of this entire process, as they are the ones that forecast the profitability of a company in the long run, based on the past performances and future trends. The focus of attaining $200 billion by 2020 is an s a result of an accountants work. The accountants in Coca-cola used the right data available at their disposal to develop the long-range profitability goal. Some of the data they used in making this long-term profitability goal decision is access to financial data across the enterprise and down to the business unit level. Also, the accountants assist in the pricing of products so that they allow for a realistic margin based on the target market (David, David and George 2011). The pricing strategies the top management has developed for the company Coca-cola are majorly informed by the information that is availed to them by the accountants, with the primary objective of optimizing profitability. Also, the accountants are important in Coca-cola as they assist in determining potential risks and offering solutions and putting controls in place that assist to prevent or reduce the impact of risks that threatens the achievement of the set goal. 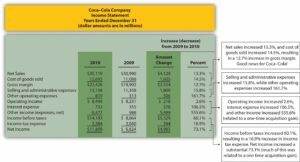 The diagram below is representative of an income statement of Coca cola, making comparison for 2 years, namely, 2009 and 2010. A trend analysis is important in the case of income statement, as well as for the balance sheet and cash flow statement as they expose on information that is important for the stakeholders to easily make decisions (David, David and George 2011). From the diagram, it is evident that the net sales made in 2010 increased by $4,129,000,000 from the previous year sales, which is an equivalent of 13.3% increase. The Coca-Cola, (2018) furthers that the cost of goods sold also increased with $1,605,000,000, translating to 14.5 percent. The increase in these two consequently led to an increase in gross margin of 12.7 percent. The company experienced a significant increase in income by 555.6 percent, based on a one time gain realized through the acquisition of Coca-Cola Enterprises, Inc in 2010. The diagram that follows is a representation of Coca cola’s balance sheet for the years, 2009 and 2010. In trend analysis, the first issue that needs to be noted and taken care off is the situation of current assets versus current liabilities. The balance sheet indicates that the company is liquid and that it can meet its current obligations without strain. It is evident in 2009 and 2010 as the current liabilities, are less compared to the current assets. Furthermore, the current liabilities and current assets have increased from 2009 to 2010. The company is still stable, as the increase in the liabilities is still within range and not capable of diluting the current assets (Martinne 2009). Some of the factors that may have led to changes in the sales and income of the company are foreign exchange fluctuation and high costs for sugar and aluminum, bad debt, and an overall weak US economy. An increase in income and sales over the year is an indication that the economy is stabilizing and the currency gaining its value once more. Also, the positive change is a result of an economy’s growth in favor of the foods and beverage industry (Paul and Sam 2009). Paul and Sam (2009) elaborate that financial statements are important for the shareholders as it informs them on corporate matters as well as on voting decisions. When making a determination on decisions to make, in the case of the income statement, the shareholders often check for earnings per share and how that compares to the previous quarters (The Coca-Cola Company, 2016). This gives the shareholders with the idea of whether the earnings per share are increasing and if they are, at what rate. An increase in growth of the earnings per share is an indication of the potential stock price increase. According to David, David and George (2011) balance sheet is an important part of financial statements necessary for the shareholders of a company, as it illustrates how sound a company is. Shareholders seek to know more about cash and equivalents, accounts receivable, inventories and long-term debt. They determine that a company with a lot of cash, with little or no debt at all, is financially stable and can easily counter the potential downturn. On the contrary, when a balance sheet indicates more debts to be met in current liabilities that indicates that the company is in a precarious situation as it is unable to meet its current obligations. However, when examining the balance sheet, the shareholders look for a variety of things and give them weight based on a company, economic conditions and market conditions (Paul and Sam 2009). The balances sheet further indicates that there is an increase in the cash and cash equivalents in the year 2010, an increase of 22.4 percent. More increases in the current assets section include marketable securities with an increase of 122.6 percent, accounts receivable with an increase of 17.9 percent, and merchandise inventory with an increase of 12.6 percent while other current assets increased by 42.0 percent (The Coca-Cola, 2018). This section illustrates on the performance of Coca cola through calculations of various ratios and appraisal methods. The measurements of the ratios discussed below will be based on a company’s financial statement. The ratios will assist to comment on whether it is on the right path or it is in the some corrective measures need to be taken. These ratios are important for investors and market analysts in the evaluation of equity. The ratios are measures, and it is important to use many measures when assessing the financial position and potential of a company growth because there is no single measure that is can address all those goals effectively (Stephen 1998). 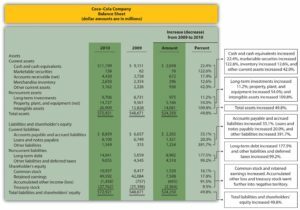 In regards to (The Coca-Cola, 2018), with are the profitability ratios which are known as a group of financial metrics that are used to measure how a company is capable of generating earnings. It is important to note in the first instance of return on equity which is a reflection of the percentage of shareholders equity that gets returned as net income. Profitability ratio is a tool that generally elaborates on the profitability of a company based on the funds that are invested by shareholders. To determine the efficiency of the company, then, the operating profit margin becomes inevitable (Terence and Terry 2003). In the case of coca cola, above are some of the profitability ratios for 2009 and 2010. From the profitability ratios that are given for the coca cola company for the years, 2009 and 2010, it is possible to determine its profitability through its revenue generation streams. It is also important because it highlights on the profits other than expenses and other costs. No matter how well the management is running the company, there are sometimes when a company has to face ups and downs. As we can see that the company is performing well in almost every profitability ratio. The company is performing exemplary in Net Profit Margin Ratio and Return on Equity Ratio. The ratios further indicate the ability for coca Cola to spend less and generate more profit (Spender, 2014). In regards to Nabil (2014), liquidity ratios are the second type of ratios and they are metrics that are essential in the measurement of the performance of a company in the short-term operations of a business. It indicates if a business is in a position to meet its current debts or short term debts using current obligations. The most common ration for liquidity testing is the current ration which reflects current assets divided by liabilities, the ratio is meant to give shareholders an idea on company’s efficiency to cover short-term debts using their current assets. A good current ratio indicating excellent performance of a company is one that is high. It also gives an idea to the shareholders on a company’s capability to raise cash when needed (The Coca-Cola, 2018). Coca cola is performing well, however, not optimally in terms its ability to meet its current obligations. For any company to have the capability to meet its current obligations with the current assets that they have, they need to have most of the ratios standing at more than 1. In the case of this company, the current ratio for 2009 and 2010, they are all good as they are above 1. However, there was a slight decrease from 1.28 in 2009 to 1.17 in 2010, and that means that the company is supposed to ensure that it reduces its current liabilities as it increases its current assets, as negative trend over the years is dangerous and would lead the company into short term debts that they are unable to meet with their available short term liquid resources. However, quick ratio indicates that the performance of the company is not good, as it is unable to meet its current obligations, as for both years, the ratios are below 1. Just like in current ratios, there has been a decline in quick ratios over the year, 2009 and 2010, and that is not a good indication for the company (The Coca-Cola, 2018). The company should work towards decreasing the number of short term liabilities so that the available resources can meet the short term needs in case of a need. The liquidity ratios show that the company is able to meet their goals using their assets efficiently, however, it needs to be improved to ensure that there is no negative trend that can be detrimental (Collier and Agyei-Ampomah, 2010). Debt ratio on the contrary is a metric that is used to illustrate on a company’s debt situation. Debt-to-equity ratio is one of the underlying ratios and it is used to measure the financial leverage that a company has, which is realized through dividing stakeholder equity with total liabilities. A company that is positively growing with its own financing it has a high debt-to-equity ratio. Another ratio that is common is interest coverage ratio and it is known for the measurement of ease at which a company tackles the interest that is accruing on its debt (Aidan and Robin 2010). The two ratios are specifically tailored to examine the mix that coca cola has made for their equity against debt. Coca cola is a multinational company and with operations all across the globe may need more money than it readily has. Just like any other business, it has to get a debt to sustain its operations; however, ensuring that the debt is not too much is something prudent. A balance needs to be striked between equity and debt as each has a cost of maintenance. In accordance to Aidan and Robin (2010), it is important that debt ratio remains less than 1 at all times, as beyond that is an indication that the company does not have the capability to pay for its debts and meets its financial obligations with the capital that is readily available for operations. For all the two years, namely, 2009 and 2010, the debt to equity and debt to capital have been below 1, which is an indication of good performance of the company financially (Hyndman and McKillop 2006). However, good the performance of the company, such that it has a good balance of equity and debt, it is still good that the company tries to control the upward trend of increasing the debt more than equity as indicates in 2010. The upward increase of the ratios to close than 1 is worrying and the company needs to address the issue as it would soon reach to 1 in a few years time if not controlled. Paul and Sam (2009) explains that efficiency ratios as those that are designed to elaborate on how companies manage liabilities and assets. Underlying ratios in this cover include inventory turnover ratio that is characterized with revealing the number of times that a company potentially does sell and replace its inventory within a given period. The ratios output gained from this particular case is that meant for use in comparison of industry averages. Low ratios in this case do indicate low sales and inventory that is in excess. High value ratio values on the contrary are indicative of strong sales. As discussed before, these ratios are meant to elaborate on the ability of Coca Cola to use its assets to meet their liabilities. Inventory turnover ratio indicates that the ability for Coca Cola to flip its products the number of times, on average, the inventory is sold and replaced during the fiscal year for cash is good. As the inventory turnover is not too high and it is not too low. Too high turnover implies strong sales or ineffective buying while too low turnover ratio implies inefficiency and poor liquidity, possible overstocking, and obsolescence. This elaborates that Coca Cola has an excellent liquidity to meet its current obligations. As regards to Average inventory processing period Coca Cola is doing excellent and maintained at an average of 28 days, before a replacement is made. Terence and Terry (2003) eluciade on price ratios are the last group, and they are specially targeted towards the stock of a company and the perceived value it has obtained in the market. Price/earnings, commonly referred to as, P/E ratio, it is meant to assist is comparison of current share price of a company with its per-share earnings. When the P/E is high, it indicates a breakthrough for investors as there is an expectation of continued future growth in the earnings. Aidan and Robin (2010) further indicate that P/E ratio has been categorized as most useful compared to historical P/E values of the specific company under examination. Divided yield ratio on the contrary is a ratio that assists in the determination of the dividends that a company pays in relation to the share price it has given to its shareholders. In other words, the dividend yield ratio is one that is targeted to give a measure of the amount of cash flow that is received for the investment of each dollar in equity. Just as the name indicates, and as explained before, these ratios are geared at indicating the growth of Coca Cola the data above indicates that Coca Cola has grown and especially, for the price-earnings, which indicates that the company is making profit, for both years which amounts to such a generous pay to the shareholders. In other areas where the company is performing well are dividend payout ratio and dividend yield ratio. As at 2015, the stocks for Coca Cola were underperforming as compared to those of the competitors such as Pepsi and Monster Beverage Corporation. While the stocks for Coca-cola improved with an increase of 3.3% from 2014 to 2015, those of Pepsi and Monster Beverage Corporation increased by 20.7% and 76.3% respectively. Coca-cola earnings per share did reduce by 4.3% to 0.04. The coca cola stock further surged per share by 2.8% so that it moved to $42.2 per share. The surging was as a result of an increase in the earnings per share increasing to $0.44 compared to the analysts’ prediction of $0.42. During this particular period, the company equally performed dismally as its revenues and sales. The sales productivity of carbonated drinks for the company during this period was not the best as there was a downward trend. The company needed to rectify this particular behavior on time, so as to increase or maintain sales to ensure that the revenues equally increase. The performance of Coca-cola sharply declined from 2014 all the way the way to 2015. That implies that an increase in share price in the company is met with a decreased performance. That implies that a two for the years, 2014 and 2015 had an inversely proportional relationship (Whittington, 1980). Competitors such as Pepsi and Monster Beverage Corporation. While the stocks for Coca-cola improved with an increase of 3.3% from 2014 to 2015, those of Pepsi and Monster Beverage Corporation increased by 20.7% and 76.3% respectively. Coca-cola earnings per share did reduce by 4.3% to 0.04. The coca cola stock further surged per share by 2.8% so that it moved to $42.2 per share. The surging was as a result of an increase in the earnings per share increasing to $0.44 compared to the analysts’ prediction of $0.42. During this particular period, the company equally performed dismally as its revenues and sales. The sales productivity of carbonated drinks for the company during this period was not the best as there was a downward trend. The company needed to rectify this particular behavior on time, so as to increase or maintain sales to ensure that the revenues equally increase. The performance of Coca-cola sharply declined from 2014 all the way the way to 2015. That implies that an increase in share price in the company is met with a decreased performance. That implies that a two for the years, 2014 and 2015 had an inversely proportional relationship (Whittington, 1980). In conclusion, it is clear from the report that coca cola is a multinational company that has operations in more than 200 countries across the globe. The company deals in the delivery of a number of soft drinks products, and it has remained a giant competitor amongst in this particular industry. The company too does trade in the NYSE stocks. Ideally, the report was tailored to elaborate on the financial performance of the company through the examination of its financial objectives, and how it performs financially based on its books of accounts. It has shown that Coca-Cola is founded on one financial objective of seeking to increase profitability by double folds in 10 years time. Further, it is clear that the objective by Coca-Cola is SMART, implying that it can be achieved and realistic enough. In so doing, the company has come up with strategies that can guide attaining this particular objective within the set period. The strategies include; plan to increase sales by double fold by 2020, targeting the emerging markets such as China, increasing the stream of income generating brands as a way of diversification, and redefining the developed nation’s market so that the existing Coca-cola products can be priced differently and packaged in a variety of sizes. The report further indicates on an accountant’s importance in the entire process of realizing the financial goal of the company. Upon examining the ratios to determine how well or how dismally the company is performing, most of them indicated that the company is doing well, however, in some instances; the company needs to monitor and control its performances so that it does not keep on trending towards the negative side, even when it is in the recommended level of ratio. A negative shift at last, leads to a negative performance, if not regulated, as the ratios move way beyond the recommended range. Most of the company’s ratio are within the right zone, with few indicating the company operating dismally, particularly the quick ration which deals with comparing current assets and current liabilities. Some of the areas that the Coca-cola needs to regulate to avoid a further shift to the negative side include liquidity of the company and debt ratio. Even though, the profitability of the company improved from 2009 to 2010 that can be explained to be as a result if increased funding into its operations with debt, other than equity. In Overall, the company is performing well and that explains why it has remained the world’s largest beverage company. Aidan, Berry, And Jarvis Robin. Accounting In A Business Context. London: Cengage Learning Emea, 2010. Company — A Case Analysis’, Journal Of The International Academy For Case Studies, 17, 8, Pp. 79-86, Business Source Complete, Ebscohost, Viewed 28 April 2018. Cordis, As 2014, ‘Accounting Ratios And The Cross-Section Of Expected Stock Returns’, Journal Of Business Finance & Accounting, 41, 9/10, Pp. 1157-1192, Business Source Complete, Ebscohost, Viewed 28 April 2018. David, Campbell, Edgar David, And Stonehouse George. Business Strategy: An Introduction. London: Palgrave Macmillan, 2011. Hyndman, N, & Mckillop, D 2006, ‘Monitoring, Supervision And The Use Of Accounting Ratios: A Study Within The Irish Credit Union Movement’, Irish Accounting Review, 13, 1, Pp. 69-96, Business Source Complete, Ebscohost, Viewed 28 April 2018. Jawahar, Lal. Cost Accounting 4e. London: Tata Mcgraw-Hill Education, Paul M. Collier, Samuel Agyei-Ampomah. Lantto, A, & Sahlström, P 2009, ‘Impact Of International Financial Reporting Standard Adoption On Key Financial Ratios’, Accounting & Finance, 49, 2, Pp. 341-361, Business Source Complete, Ebscohost, Viewed 28 April 2018. Martinne, Geller. Reuters. November 17, 2009. Https://Www.Reuters.Com/Article/Us-Cocacola/Coca-Cola-Aims-To-Double-System-Revenue-By-2020-Idustre5ag03320091117 (Accessed April 26, 2018). Nabil, Yafai. Interexchange. 2014. Https://Www.Interexchange.Org/Articles/Career-Training-Usa/2016/03/08/History-Coca-Cola/ (Accessed April 28, 2018). Paul, Collier, And Agyei-Ampomah Sam. Management Accounting Risk And Control Strategy. New York: Elsevier , 2009. Rosemary, Walker. “Empirical Analysis Of Up-Or-Out Rules For Promotion Policies .” Journal Of Economics And Finance , 2005: 172-173. Spender, J. Business Strategy: Managing Uncertainty, Opportunity, And Enterprise. Oxford: Oup Oxford, 2014. Stephen, Weinstein. Journalofaccountancy. April 1, 1998. Https://Www.Journalofaccountancy.Com/Issues/1998/Apr/Weinstn.Html (Accessed December 11, 2017). Terence, Lucey, And Lucey Terry. Management Accounting. New York: Cengage Learning Emea, 2003. The Coca-Cola Company . Coca-Colacompany. April 27, 2016. Https://Www.Coca-Colacompany.Com/Stories/Five-Strategic-Actions (Accessed April 2018, 2018). The Coca-Cola, C 0004, ‘The Coca-Cola Company Reports Solid Operating Results And A Positive Start To 2018’, Business Wire (English), 4, Regional Business News, Ebscohost, Viewed 28 April 2018. The Coca-Cola, C 0002, ‘The Coca-Cola Company Reports Strong Operating Results For Fourth Quarter And Full Year 2017; Achieves Or Exceeds The Company’s Full Year Guidance’, Business Wire (English), 2, Regional Business News, Ebscohost, Viewed 28 April 2018. The Coca-Cola, C 0007, ‘The Coca-Cola Company Reports Second Quarter 2017 Results’, Business Wire (English), 7, Regional Business News, Ebscohost, Viewed 28 April 2018. The Coca-Cola, C 0002, ‘The Coca-Cola Company Reports Fourth Quarter and Full Year 2016 Results’, Business Wire (English), September, Regional Business News, Ebscohost, Viewed 28 April 2018. The Coca-Cola, C 0010, ‘The Coca-Cola Company Reports Third Quarter 2016 Results’, Business Wire (English), 10, Regional Business News, Ebscohost, Viewed 28 April 2018. Whittington, G 1980, ‘Some Basic Properties Of Accounting Ratios’, Journal Of Business Finance & Accounting, 7, 2, P. 219, Business Source Complete, Ebscohost, Viewed 28 April 2018.